Train toys are timeless and you will make no mistake if you decide to surprise your child with the exciting toy vehicle. This toy is designed to gather the whole family to enjoy quality time together and play with it. And if you have had enough of those typical techno tools and toys, here’s something classy that your kid will enjoy to the hilt. The kids enjoy train toys a lot, no matter how old they are. There are many train toy models that can provide your kid the fun that they want, depending on the age and skills required to play with the toy. In this review, let’s explore the best train toy products you can buy online, so that you can have a clear idea of which train toys will make your child enjoy hours of fun. Why we like it: Kiddzy Toys train set is a great toy for young children who like engaging toys which ultimately improve their cognitive and coordination skills. This train set is designed to provide the whole family with quality time during which your child will learn how to make the polygon for train which is an action that enhances cognitive abilities. 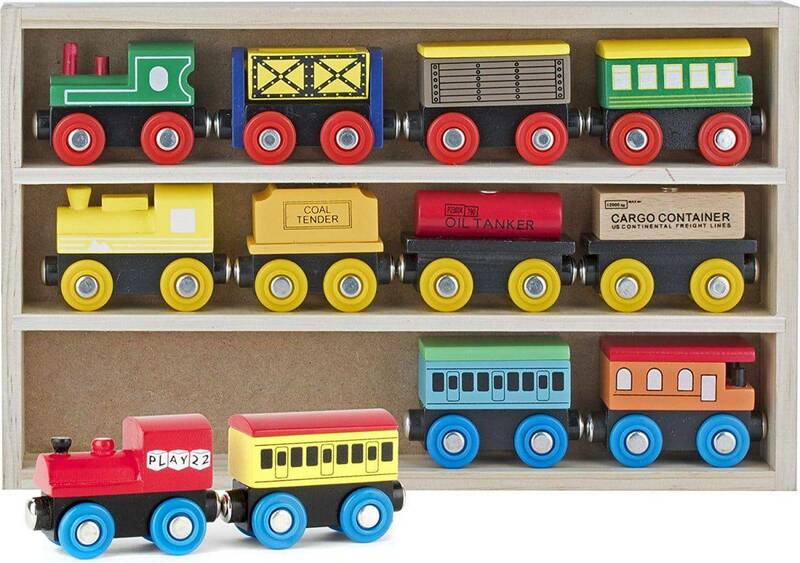 Also, your child will enjoy the design of this wooden train toy as it features colorful and engaging looks. 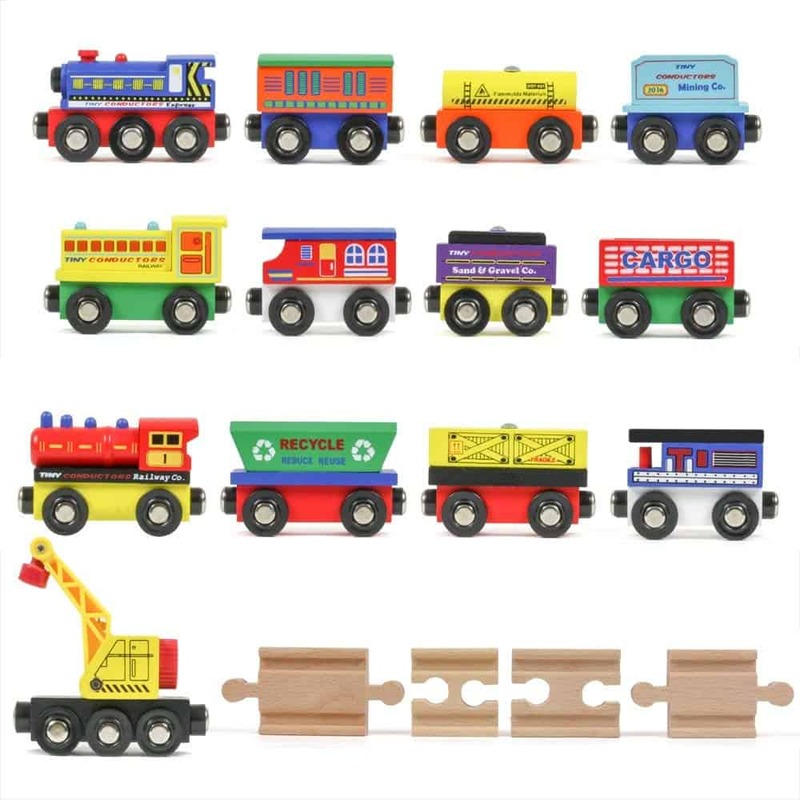 The wooden train set is made of premium quality wood materials which are meant to improve the durability of the toy set. Also, this toy product passed all the safety tests which means that your child can play with it and remain unharmed. The tracks are compatible with similar train set, so your kid can buy similar toys and come with unique ideas to set up a larger train polygon from different sets. The train set is made of quality wood. The toy features an engaging and colorful design. Train tracks are compatible with similar products. It can be difficult for your child to build the whole set all alone, so you should assist from time to time. Why we like it: WolVol electric train features a unique neon design and plays music when active, which means that your kid will adore it. WolVol electric train toy for kids features a clean window material, specially designed for the 3D lighting system inside the train which steals the show once the lights are out and the train goes full speed around the room. The train also features Bump and Go Action which enables the train to run smoothly on various surfaces. Also, the Bump and Go Action feature helps the train find another direction once it bumps into something. This means that you can freely direct it wherever you want as the train will find a way out. The train is charged with 3 AA batteries that are placed underneath the battery cover which you will find on the bottom of the toy. The toy features a cool 3D lighting design. Bump and Go Action makes it easier for you to control the train. This toy train is easy-to-use and play with. Although the train automatically changes the direction once it bumps into something, you will have to manually navigate sometimes. 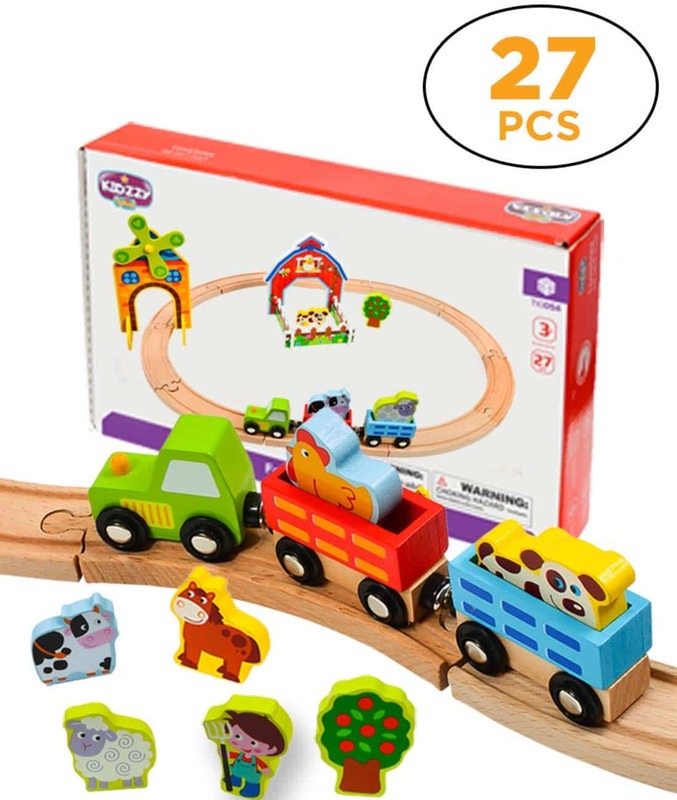 Why we like it: Play22 offers a classic, high-quality wooden toy train set, which is great for toddler boys and girls who want to play with delicate toys. Play22 wooden toy train set includes engines, tender, coaches, convertible coach-hopper car, cargo car, magnetic cargo load, tanker car magnetic tanker load, hopper car, and cabooses. All these parts will make it fun for your kid to build the whole construction and see how the train set elements should be connected. This train set features magnets placed in the train wheels which improve the train’s stability on the track. Also, this train set is educational as it helps your kid develop color recognition and motor skills. The toy is designed for toddlers who are ready to explore more complex sorts of toys. This wooden train set is made of quality wood. The train wheels feature magnets which stabilize the train while it’s on track. The toy improves your child’s cognitive and motor skills. The set features track construction parts which may seem confusing to your child in the beginning. Why we like it: This LEGO DUPLO Cargo Train set is an advanced toy which will bring tons of fun, both for children and their parents. LEGO DUPLO Cargo Train set is designed to let kids and toddlers build a train and a train track along with additional buildings and vehicles. The set includes 105 pieces, 2 cargo wagons, harbor, boat, café, 24 track pieces, and a remote control application. The train assembly process is challenging and your kid will have to follow precise instructions to successfully build the train station. Also, this set includes battery operated parts which produce lights, sounds and movement. The train set enhances the development in language, fine motor skills, and cognitive abilities for kids who are 2-5 years old. This train toy will prove as a good investment as it’s a unique LEGO set which is designed to be fun and educational. This train toy will make you spend hours playing with it. LEGO DUPLO Cargo Train set has a battery operated units, which improve the overall excitement with the toy once you set everything up. This LEGO train action block set improves your child cognitive and motor capabilities. The set contains tiny parts, so you should pay attention to how your child uses them. Why we like it: WolVol train set offers a variety of train toys that feature different designs which your child will find exciting. WolVol train set features 12 different train toys that your kid can use to create train races all over the room. If you want to get the trains going, you should pull back each train and watch it zoom away with enhanced speed. You don’t need the batteries for this train set as all the trains included use a simple mechanism to move. The trains are made of high-quality materials that provide them with strength and durability, so your kids can play with them for hours. Each train features unique colors and design details, which means that your children might want to start creating a collection of these trains and explore various designs. This train set features 12 trains that feature a unique design of each. You don’t need the batteries to get these trains moving. The trains are made of high-quality materials which ensure their durability. Some users report minor problems with the train’s movement mechanism, which means that you shouldn’t use the toy aggressively. Why we like it: Kidzzy Toys offer a well-designed wooden train set that develops your child’s cognitive skills, especially color recognition skills. Kidzzy Toys wooden train set features a great design that young users will find engaging and fun. 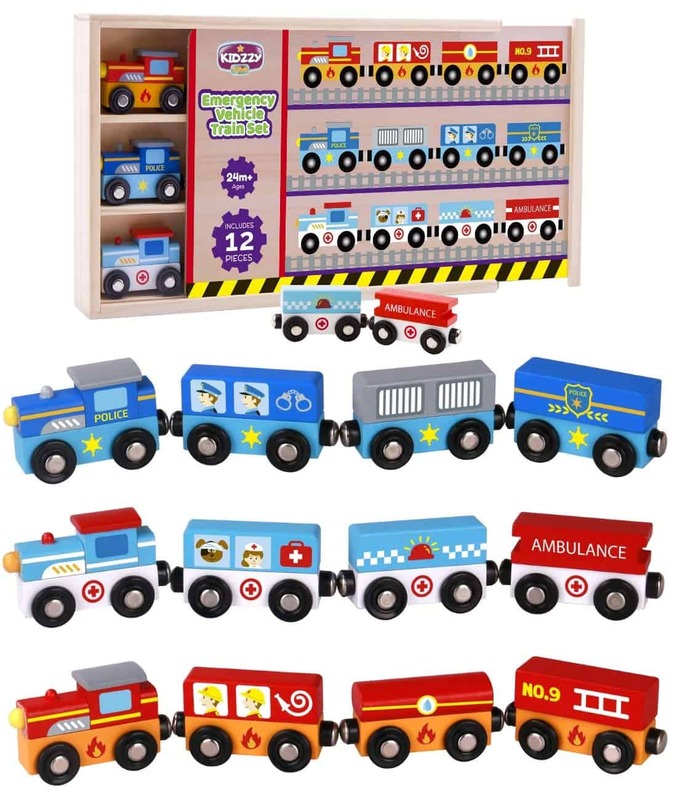 The set includes 12 wooden trains, 4 police, 4 fire, and 4 ambulance trains which all can sparkle up your kid’s imagination full of exciting stories. This wooden train set passed all the safety tests, so you won’t have to worry if the bad scenarios might occur. Also, Kidzzy Toys train set will help your child develop color recognition and fine motor skills, which means that the toy has the educational value. This train toy can be a great gift for birthday and holidays as it will provide kids with hours of fun. The train set has an engaging design that children will find adorable. The toy passed all the safety tests. Kidzzy Toys train set will improve your child’s cognitive and fine motor skills. Some users reported that the color tends to wear off a bit after extensive use. Why we like it: Thomas the Tank train toy is designed to maximize your child’s excitement and provide it with quality time both indoors and outdoors. 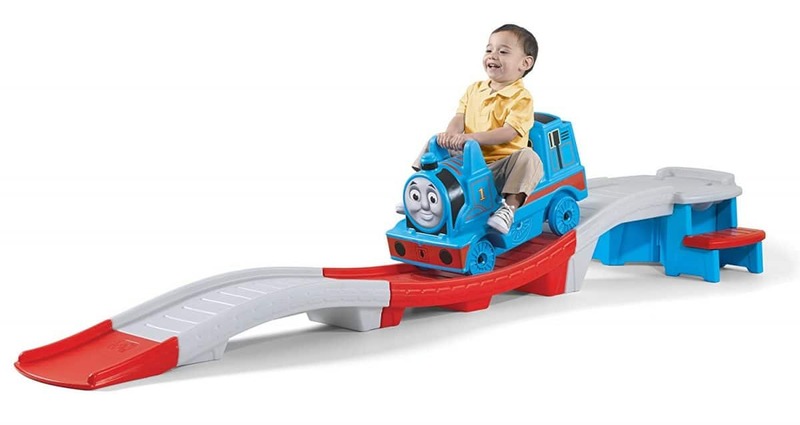 Thomas the Tank up and down roller coaster is designed to be a portable roller coaster, perfect for toddlers. Your child can easily access the coaster by using specially designed non-slip steps placed on the sides of the track. The train car features a unique Thomas the Tank design, well-known from the famous cartoon. Also, roller coaster car features a high seat back, with a hand-rail and footrests, for the comfortable and safe use of the toy. The roller coaster track features over nine feet of length, which is just enough for exciting roller-coaster experience. The set can be set up both indoors and outdoors, which means that your child can enjoy this train toy anytime during the year. Thomas the Tank roller coaster train toy is exciting for toddlers and makes them enjoy physical activity. The toy is made of high-quality materials which ensure its durability. The roller coaster car features a safety-oriented design that will keep your child secure. If you want to use the toy indoors, you will need a spacy room, which means that the toy is not suitable for smaller apartments and houses. Why we like it: FUN LITTLE TOYS train set is a colorful and engaging toy which helps your child develop fine motor and cognitive skills. This train set includes train tracks, train stations and transit signs which all feature vibrant colors that improve your child’s color recognition skills. The set is composed of 8 rectangular rail tracks that feature puzzle-like joints. These rail tracks are meant to motivate your kid to investigate which joint shapes are compatible and, therefore, solve the puzzle and set up the rail track construction. Also, this train set is equipped with automatically-moving electric mini train that travels freely along the tracks. This toy is educational as it improves the development of your child’s cognitive and fine motor skills. The train set requires 2 AAA batteries so the electric components can work. 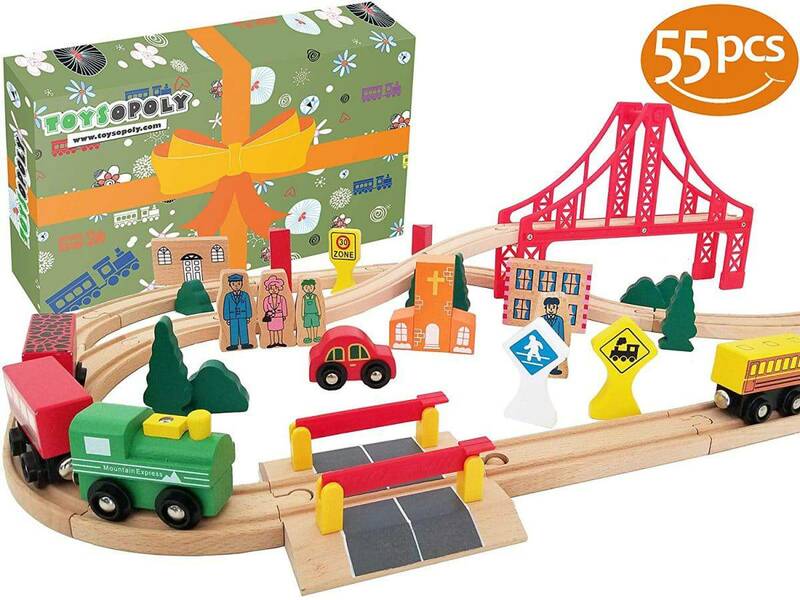 The toy features engaging puzzle-like rail tracks that are inspiring for toddlers to assemble. This train set improves the development of your child’s motor and cognitive abilities. 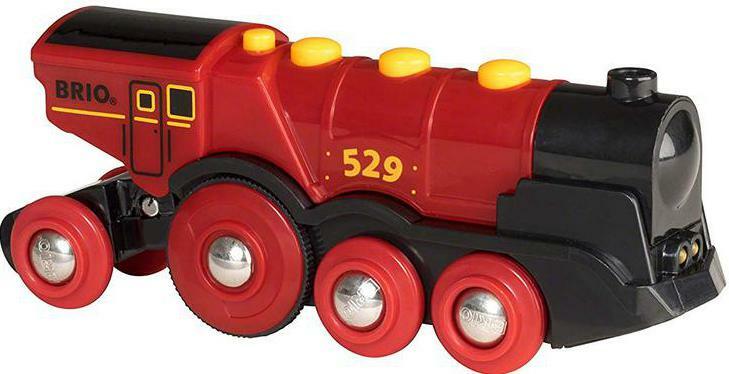 Colorful design makes this train toy fun to play with. Some users reported minor problems with the performance of electric components. Why we like it: ToysOpoly wooden train set features traditional train toy design which proves as timeless and engaging even for parents. ToysOpoly train set is a high-quality product that is made of real beechwood with smoothly connected parts and a great design. The set includes 55 pieces that feature 4 trains, 1 car, 1 red bridge, 3 destination and other accessories, plus wooden rail tracks. The train set is also compatible with standard train sets like Thomas railway system, Brio, Mellisa and Doug, Kidkraft, Imaginerium and many more popular toy sets. Also, this train set is designed to sparkle up your child’s imagination that has plenty of unique stories and scenarios. The toy is also educational as it improves your child’s cognitive and fine motor skills. This train set passed all safety tests, so your child remains secure while playing with it. The train set is made of high-quality wooden materials. ToysOpoly train toy is compatible with all the most popular train toy sets. This toy improves your child’s cognitive and motor development. The product contains small magnets and parts, so you should keep an eye on how your child plays with the train set. Why we like it: This high-quality train set from ToysOpoly features well-crafted toy trains and durable construction that can withstand hours of fun. ToysOpoly toy train set is made with high-quality beech wood with quality connected parts which enhance the toy’s durability and let your child enjoy playing with it for longer periods of time. The train set is compatible with all the popular sets like Thomas Railway System, Brio, and Melissa and Doug among others. This toy set can prove as very beneficial for your child’s early learning as it improves a child’s color recognition skills and fine motor capabilities. The toy is meant to provide your child with hours of creative playing that should inspire your child’s imagination. ToysOpoly train set can become a valuable gift for birthdays and holidays. Also, this toy passed all the safety test which means that your child is protected while playing with the set. The train set features high-quality parts that enhance the toy’s durability. ToysOpoly toy train improves the development of your child’s cognitive and fine motor skills. The toy is safe to play with. The toy is not strong enough for rough play, so you will need to tell your kid to use it cautiously. 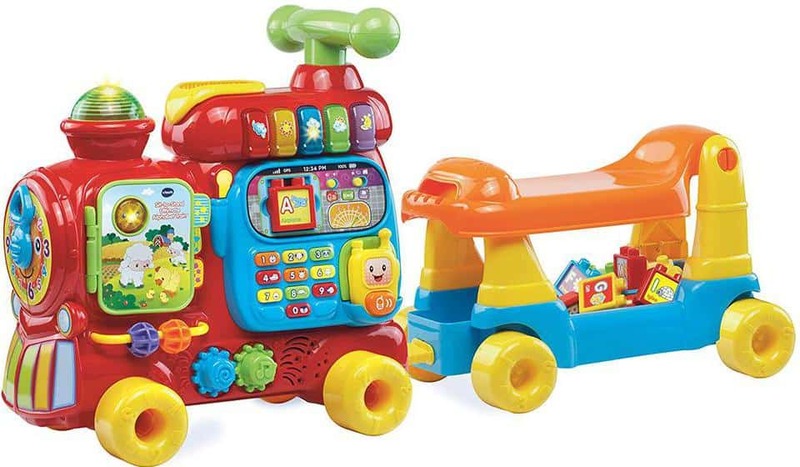 Why we like it: VTech train toy is designed to grow along with your child and become more fun with time. Vtech offers a toy train that is designed to provide your child with various funny functions that become more interesting as your child is in the phase of fast cognitive development. The toy train can be used as a floor toy because children who are up to 3 years old can ride it. Also, the train can serve as a toy wagon, but your child will notice with time many interesting options and games on the train car which are designed to improve cognitive skills. Vtech train toy will help your child learn the alphabet, improve color recognition skills and understand the shapes. The toy is meant to improve your child’s spatial intelligence. Vtech learning toy comes with 10 activities including a storybook, clock, gears, and 12 double-sided alphabet books. Vtech toy is a great learning toy that will improve your child’s cognitive development. The train is made of high-quality materials which ensure its durability. This toy can remain fun and engaging through different development stages. Some users reported problems with stickers that fall off. Why we like it: PowerTRC offers a high-quality train toy set which provides your child with 12 different trains and hours of fun. 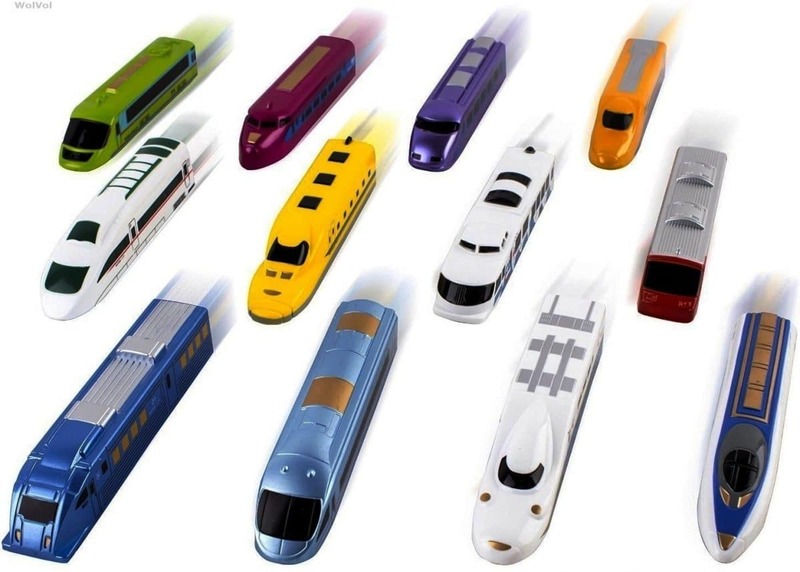 This train set comes with 12 colorful trains that feature unique styles and colors which your child can find exciting. PowerTRC toy trains don’t need batteries to move as they are friction powered. If you want the train to move around, just pull back the vehicle, release it, and watch it zoom forward at high speeds. All the trains in the set feature high-quality materials which ensure the toys’ durability and performance. Also, the trains are small in size and lightweight which means that your child can carry the trains wherever and have fun. Different train designs have beneficial effects on your child’s cognitive development as they improve your child’s memory and object recognition. The train set includes 12 well-designed trains that feature high-quality construction and enhanced durability. These trains are friction powered, which means that you can get them moving whenever and wherever. PowerTRC train set has beneficial effects on your child’s cognitive development. Some users reported color wearing off after extensive and rough use. 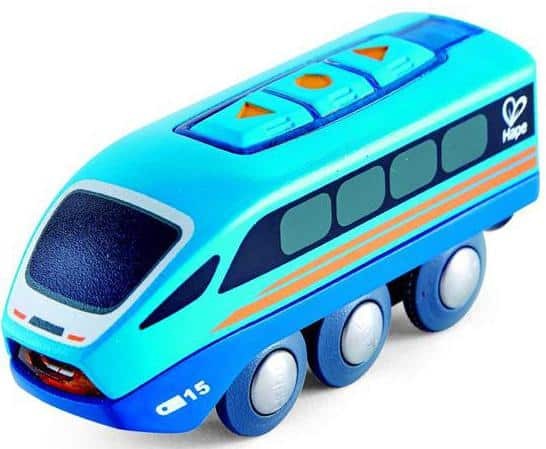 Why we like it: Hape remote control train car is designed to provide your child with tons of fun and features an interesting design. Hape train toy comes with advanced remote control features that include a Bluetooth app that lets you adjust the speed of the toy. This train can be controlled with your mobile phone, but also it features button controls on the top of it, so you can have more control options. Also, this train plays sounds which can be activated both by using your mobile phone or by pressing the control buttons on the train. Hape remote control train toy has a built-in battery which you can charge with enclosed charging cable. The rechargeable battery means that you won’t have to spend money on new batteries. Also, the train is made of high-quality materials that enhance the toy’s durability and optimum performance. Hape remote control train toy provides children with advanced control options. The toy has a built-in battery that is rechargeable. Hape toy train is made of high-quality materials that enhance the toy’s longevity. Some users report that the Bluetooth connection wasn’t suitable for devices with older Bluetooth versions, so check the compatibility first. Why we like it: Brio is a well-known brand that offers a high-quality Cargo Railway Deluxe train set which is going to impress you with its features. The Cargo Railway Deluxe Set by Brio includes 54 pieces; two trains, a battery-powered engine, 3 cranes, a truck, 1 cargo, bridge, 1 bridge, 9 support rocks and a crossing signal. All the parts in the set feature high-quality production and materials which enhance your overall experience while playing with the set. This train set is designed for creative children who can use their imagination and come up with original stories that include the action figures from the set. The railway construction is challenging to assemble and requires patience along with constructive thinking to be finished properly. 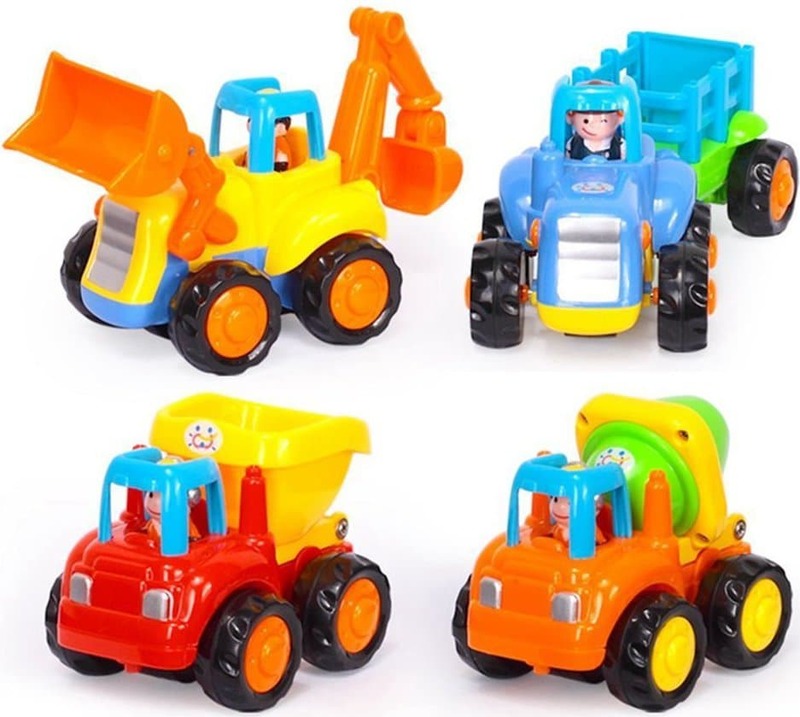 The product is safe for your kid as it’s tested rigorously and covers safety tests which are designed to check if the toy is made of poisonous materials or has any hazardous construction features. This train set features high-quality production and materials that ensure the toy’s durability and optimum performance. Brio toy train is specially designed to support your child’s creativity and imagination. The toy is perfectly safe for use. Some users are not satisfied with the track circuit design. Why we like it: HapiSimi track train features a cool LED glow design that changes colors and becomes even more exciting, once you turn the lights out. 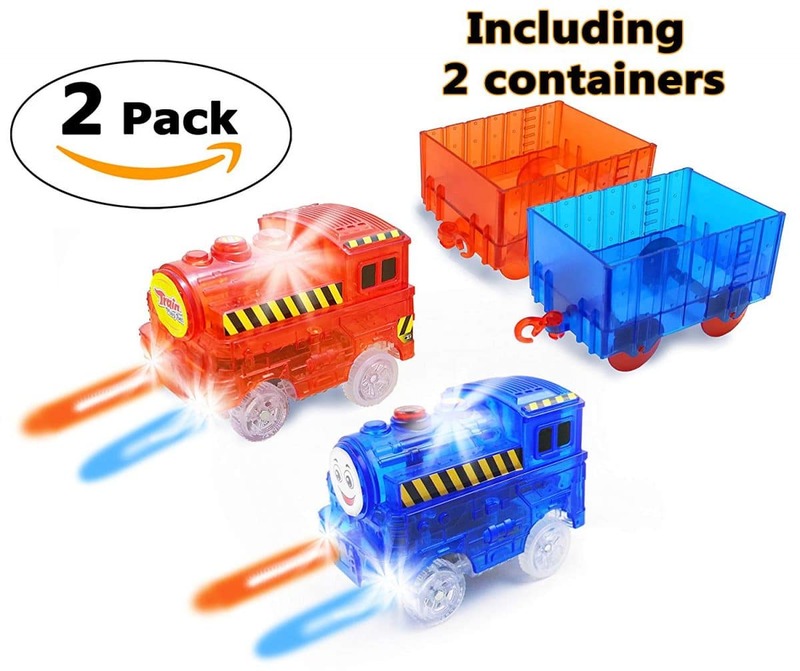 This track train set includes two track trains that feature red and blue color design with LED lights included in the train wheels. Also, this set includes 2 sticker sheets that your child will need to use to decorate the trains and see which sticker is suitable for which part of the train. Each train features five LED multicolored lights that include two headlights, one light on top and two lights inside the trains. The transparency of the train is provided by thin plastic shell construction which means that your child should learn to play carefully with this toy. Each toy car requires 2 AA batteries to power both the engine and 5 LED lights. Also, you have an option to buy a rechargeable battery that will save you money. The train’s LED lighting consumes most of the battery, so the recharging battery option proves as more practical. 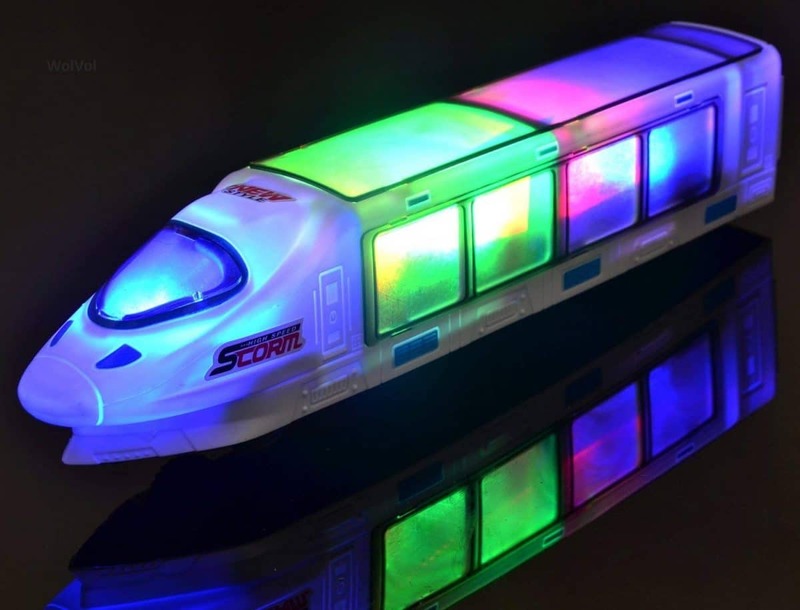 These trains feature a great LED light design that makes it exciting to play with them. The trains are made of quality materials. HapiSimi trains feature a transparent plastic construction that lets your child observe and step-by-step understand the mechanism underneath the plastic shell. LED lights consume the batteries quickly. Why we like it: This Brio train set has a simple design which is great for kids who are 18 months old and up. Also, Brio train set helps a rapid development of your child’s cognitive skills. Brio train set includes a colorful train that features reversible magnets and a rattling wagon that makes funny sounds while your child plays with the set. Also, the set includes a special rainbow bridge, guiding ramp tracks for on and off rail play, and wooden railway tracks. Your child will enjoy assembling of the railway construction and will learn how to execute the construction process and coordinate fine movements. These features will improve the development of your child’s fine motor skills and cognitive abilities, especially color recognition and puzzle-solving skills. The product is completely safe to use as it passed rigorous safety tests during the production process. The toy train set comes with numerous parts which are easy to assemble. This Brio toy train set improves your child’s cognitive development. The toy passed safety tests and it’s safe to play with. Some users reported problems with a rail track breaking after rough use. Why we like it: This LEGO train toy set is a perfect way for your child to develop cognitive skills and learn the numbers in a preschool period. 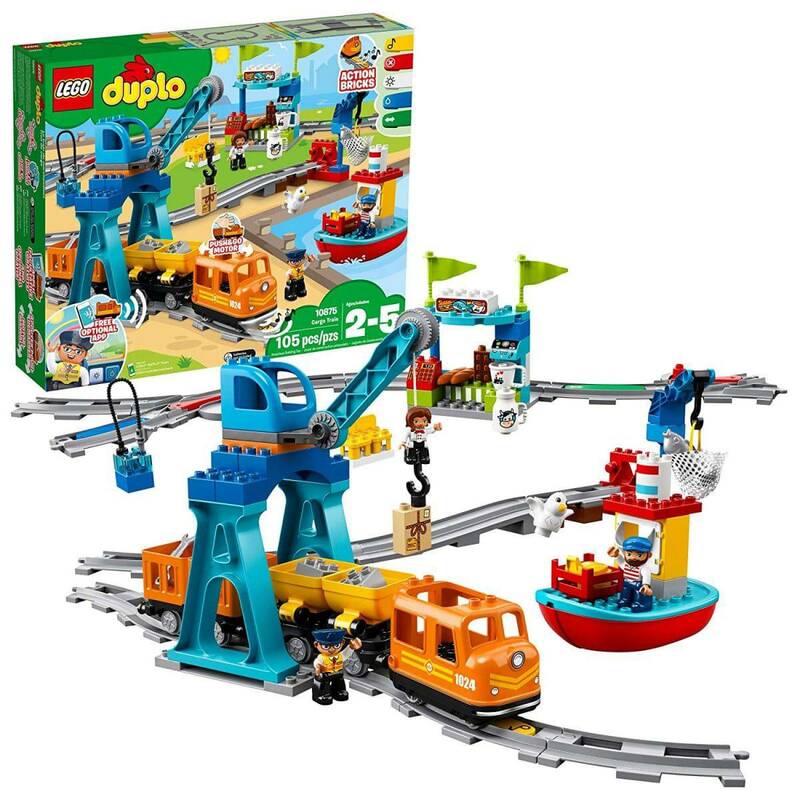 LEGO DUPLO set features a buildable locomotive and three wagons which are easy to assemble and help your child think constructively. A great thing about this LEGO set is the fact that it lets your child come up with unique train designs and construction solutions. Such a thing is beneficial for your child’s cognitive development and also it improves your child’s creativity. Also, the set comes with bricks that show numbers from 0 to 9. These numbered bricks are a great way for your child to learn simple numbers before school. The set features a bright color design that is also beneficial for your child’s color recognition skills. 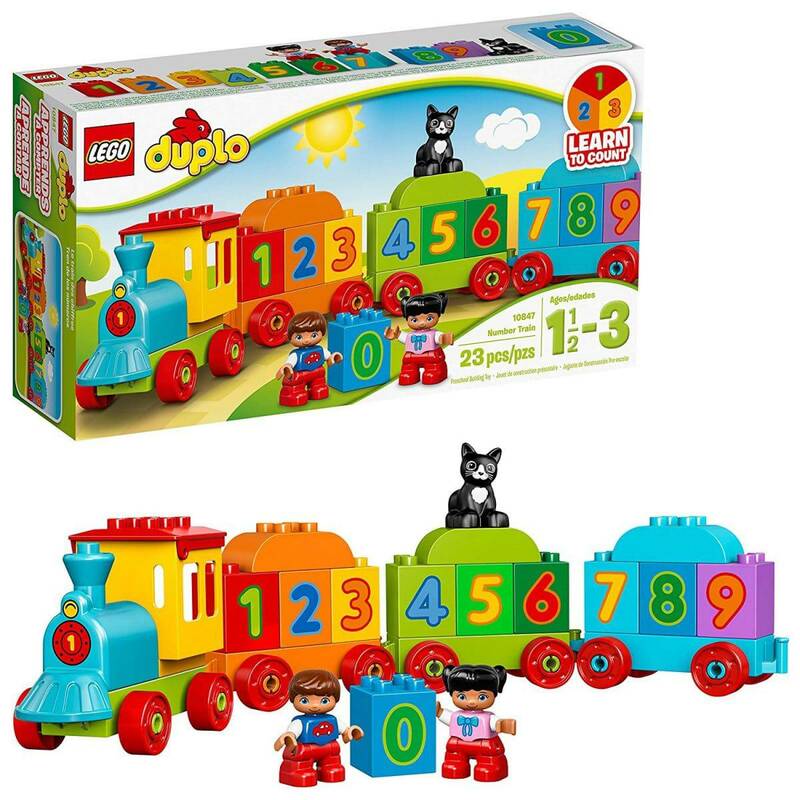 This educational LEGO DUPLO train toy benefits your child’s mental development. Number bricks will make your child learn the basic numbers with ease. The set is made of high-quality plastics. The bricks come apart easily which can be problematic if you want to drive the train around the place. Why we like it: Conductor Carl toy train set is an exciting toy that will make the whole family enjoy assembling it and playing with the set afterward. Conductor Carl toy train set comes with a 1 Conductor Carl engine car, 34 pieces of railway track, 12 vehicles, 15 people and signs, and 39 trees and houses. This train set is designed to improve your child’s problem-solving abilities and encourages role-playing which can prove as beneficial for children’s mental development. The set is large and contains lots of pieces which will take you some time to successfully assemble them. This means that the whole family can enjoy playing with the set and spend quality time together. The wooden track comes with a single-piece construction which means that your child won’t find any dangerous loose pegs. The set is compatible with all Thomas Wooden Railway items. The set is big enough for the whole family to enjoy assembling it. 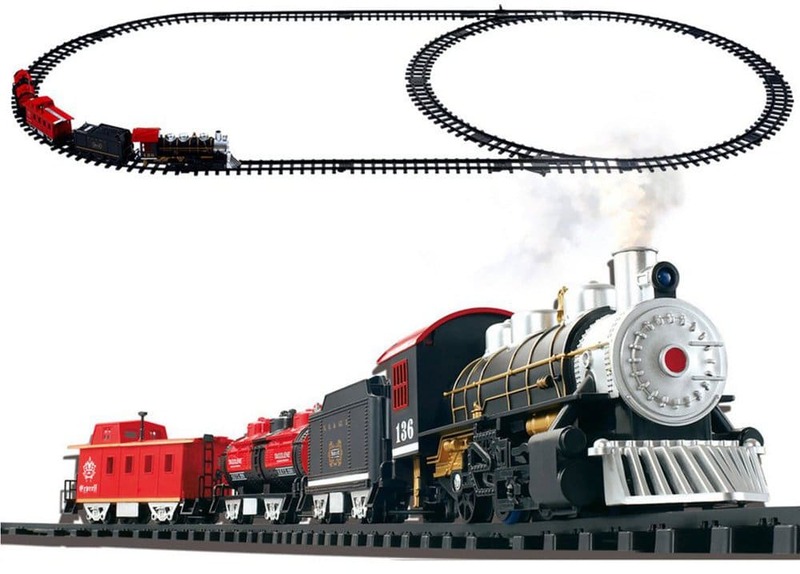 Toy train set features high-quality materials and enhanced durability. Conductor Carl set helps your child develop motor and cognitive skills. Some users report that the layout building options are too limited. Why we like it: Kidzzy Toys train set is designed to be a beginner train set that introduces kids to creative and constructive thinking. 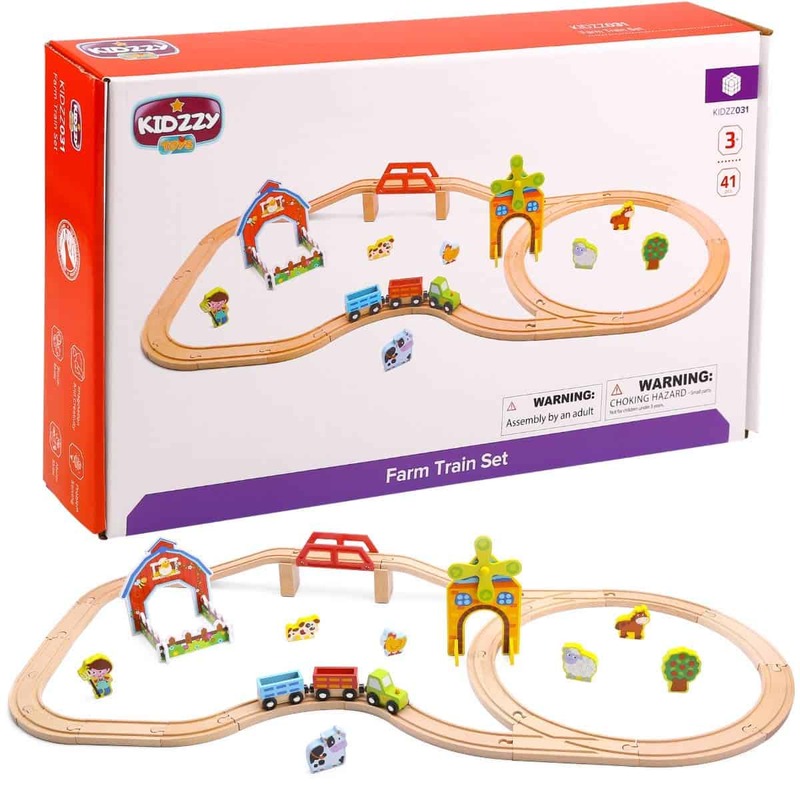 Kiddzy Toys train set features a simple design which is specially intended to make it easier for a kid to assemble the whole railway construction. 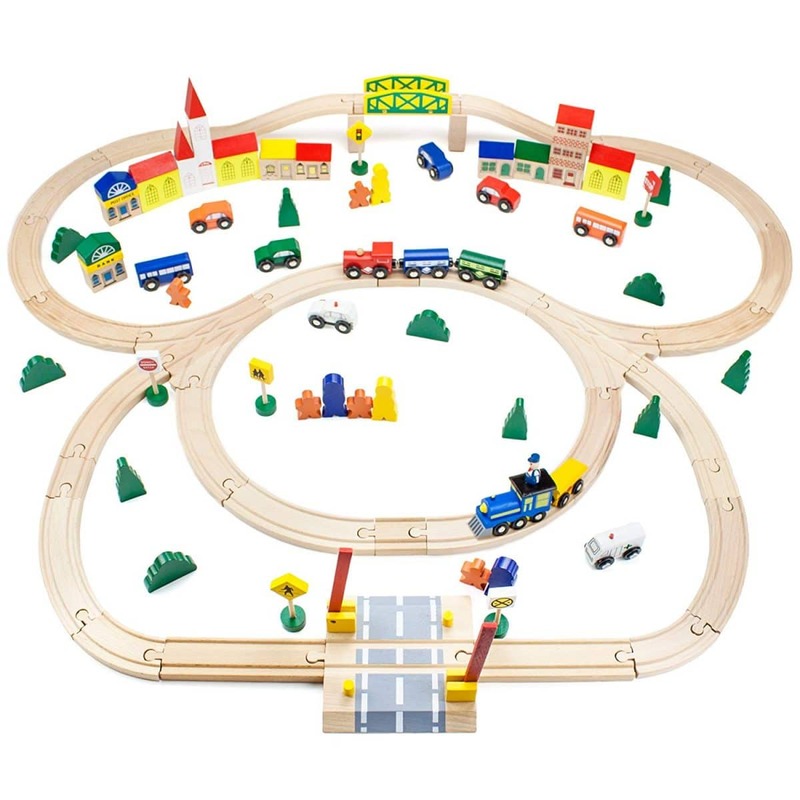 This set includes 3 magnetic trains, 10 wooden tracks and animals like horse, sheep, cow, chicken, and dog, along with the barn and windmill buildings. The tracks are made of high-quality wooden material that can withstand extensive use. Also, the tracks are double sided which makes it easier for toddlers to assemble the railway. All the products included in this set meet the quality standards, so your kid is safe while playing with the train set. This train set can be a great gift that improves your child’s cognitive abilities and benefits overall psychophysical development. The set is easy to assemble which makes it easier for toddlers to finish the construction. All the parts included in set feature high-quality materials and great durability. The toy is perfectly safe for your child to play with. Pieces of paint might chip off after extended, or rough use. Why we like it: Brio Mighty Red action locomotive comes with awesome control features and a great design that makes it exciting for a child to play with the locomotive. Brio offers a large locomotive with front and rear lights, and control buttons that enable the child to make the locomotive go forward and reverse, or cease the locomotive’s motion via stop button. The locomotive also features a signature “choo-choo” sound effects and a switch on top that allows free wheel movement without battery power. This action locomotive is designed for imaginative toddlers who are creative and like to come up with funny scenarios and stories using action toys as an inspiration. Playing with this action locomotive helps your child to learn to explore the environment in a fun way and improve spatial awareness along with fine motor skills. This action locomotive features quality and easy-to-use control options. Brio locomotive is fun to play with as it features cool sounds and a great design. This toy develops your child’s spatial awareness in a fun way. Only two wheels are driven, which means that the traction is lesser and the engine use not as optimal as it could’ve been with 4 driven wheels. Why we like it: Tiny Conductors wooden train set features a colorful and interesting design of trains and a simple railway construction that is easy for toddlers to assemble. Tiny Conductors toy train set features a working crane car that picks up the cargo, which is a great thing for imaginative toddlers who can come up with their own scenario which include toy set parts. Also, 3 train cars have a removable cargo, so your child can use the working crane to pick it up. The train tracks come in pair of 2 male-male and 2 female-female adapters that allow your child to fit the end of any track piece into any other track to complete any sort of construction. The magnets on trains are carefully chosen and extensively tested for any unexpected functional fails. The set features high-quality parts and a great design of the train and railway track. This toy train set helps the development of your child cognitive and fine motor skills. The functionality and safety of the toy are outstanding. The color can wear off after extensive use. Why we like it: Best Choice Products offers a classically designed electric railway train set, which is a great reminder of how the train toys used to look like in the past. This train set comes with realistically designed parts which come to life with characteristic train sounds and a working engine. Best Choice Products train set is meant to make adults feel a bit nostalgic, and provide younger users with tons of fun. 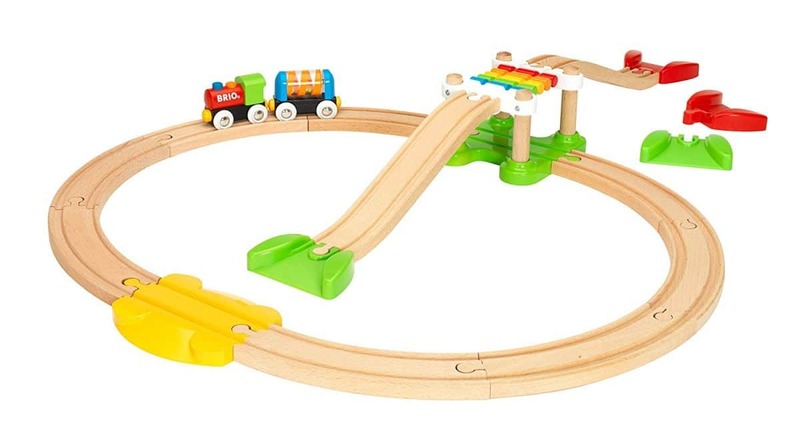 The rail track has a simple circular design which makes it great for toddlers to assemble with ease. Also, this train can serve as a decoration because you can set the railway around the Christmas tree and get the train going all night long. The tracks simply snap together and are made of durable plastic which is designed to withstand extensive use. 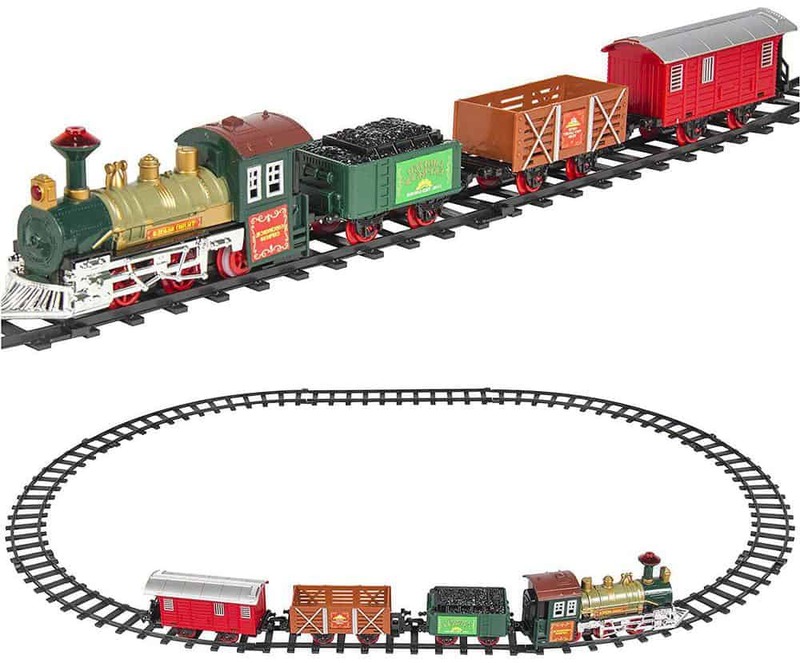 This train set features an old-timer design which is adorable both for kids and adults. You can use this train set as a decoration. The train is made of durable plastic which can endure long use. Sometimes the train won’t run if tracks are not perfectly even. Why we like it: Geefia toy train features bright and playful colors that children find attractive and engaging. This toy train produced by Geefia comes with an adorable design which is meant to occupy children’s attention and encourage them to play with the train. The train features bump and go action that automatically changes the direction of the train once it bumps into any sort of obstacle. Also, the train comes with flashing lights and music effects which improve the overall children’s excitement with the toy’s performance. This train has educational features as it encourages fine motor skills development and improves kids’ creativity and imagination. There are ABC slots on the side of the train which make it easier for toddlers to learn the beginning of alphabets. The train features a playful and colorful design. Bump and go action makes it easier for train to move around. The toy helps the development of your child’s cognitive and motor skills. You cannot adjust the volume of the train sounds. Why we like it: vrchil train set features a realistic design that even has a steam smoking simulation. Most of the kids will find such a design awesome and engaging. Vrchil train set comes with an advanced smoke simulation which uses the first class essential with no toxic substances included. Also, the train is made of high-quality ABS plastic which ensures the toy’s longevity. Also, there’s a signal light featured with loading compartment, coal loading compartment, passenger compartment and one removable compartment. This toy is not only designed to realistically represent the old-timer train models, but it’s also intended to cultivate baby’s color and shape recognition, along with eye-hand coordination and logical thinking. The rails can be arranged into many different shapes which means that your child has the freedom to come up with the original construction designs. The train features realistic design and smoke simulation. Every part of the set is made of high-quality ABS plastic. The toy helps your child’s motor skills development. Some parts of the set are not suitable for children under the age of 3. 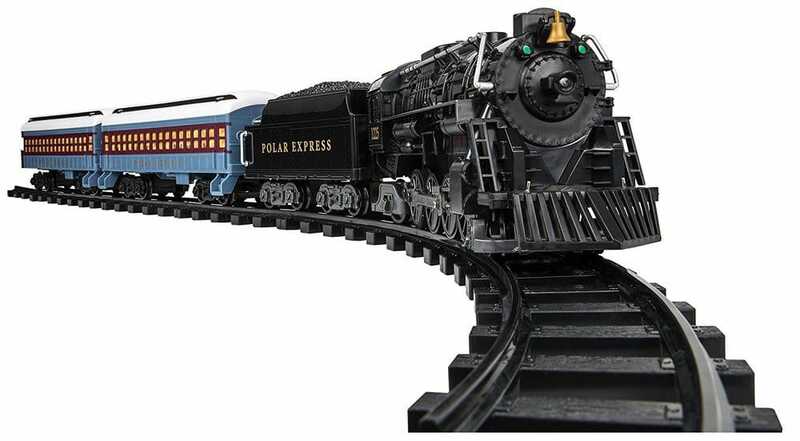 Why we like it: Lionel Polar Express train set features a detailed replica of old-timer trains that will bring lots of fun to your kids. Lionel offers a classically designed train toy which can be amusing both for kids and the adults. This train toy can be used as a decoration, so you can put it around the Christmas tree and get it going for more fun. The set features 24 pieces of curved and 8 straight plastic track pieces which are easy to assemble and well-crafted, so the train will give you a stable performance. Also, the train has a remote control option with buttons that allow the train to go forward and reverse, sound the whistle, or ring the bell. With so many options, Lionel train toy is great for imaginative toddlers who adore trains and can come up with a bunch of their own unique stories. The train uses three AAA batteries for controller powering and six C cell batteries required for the train. The toy features a great detailed design. Whole set is made of high-quality plastic material which ensures the toy’s longevity. The remote control options will make playing with the toy more fun. You can’t turn off the toy’s sounds. Why we like it: This wooden train set by Tiny Land features a cute and simple design and quality parts that younger kids will find adorable. 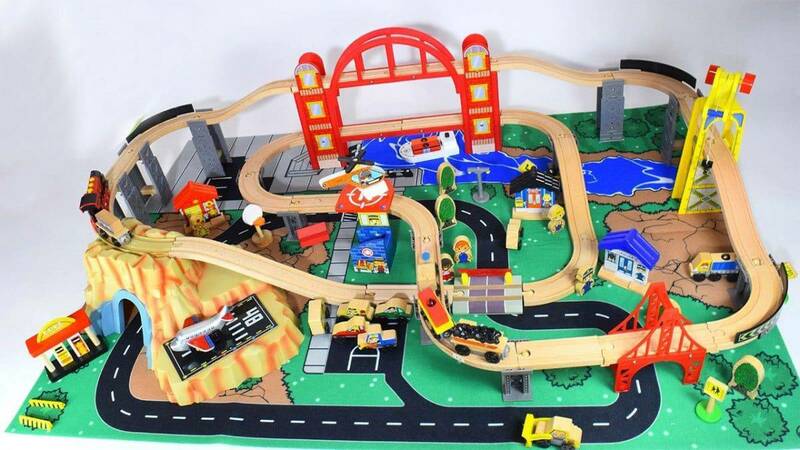 Tiny Land offers a complete wooden train set for toddlers that feature flat and curved tracks, along with a well-designed bridge, people, and many other parts which are meant to help you create the whole scenery. All the parts in the set are made of quality beech wood that is notably sturdier than pine and, therefore, more durable. Also, every part of this toy train set has hand-sanded edges for enhanced protection of your children. The Tiny Land toy train set is compatible with all the most popular toy train brands like Thomas, Ikea, Melissa and Doug, and Chuggington among the others. This means that your child can expand the set with new railway and train parts and create a unique train set. The set features high-quality parts which are notably durable. Tiny Land toy train features an effective and simple design which is great for toddlers. The set is expandable with the most popular toy train brands’ parts. Some users reported that the tracks could line up better. 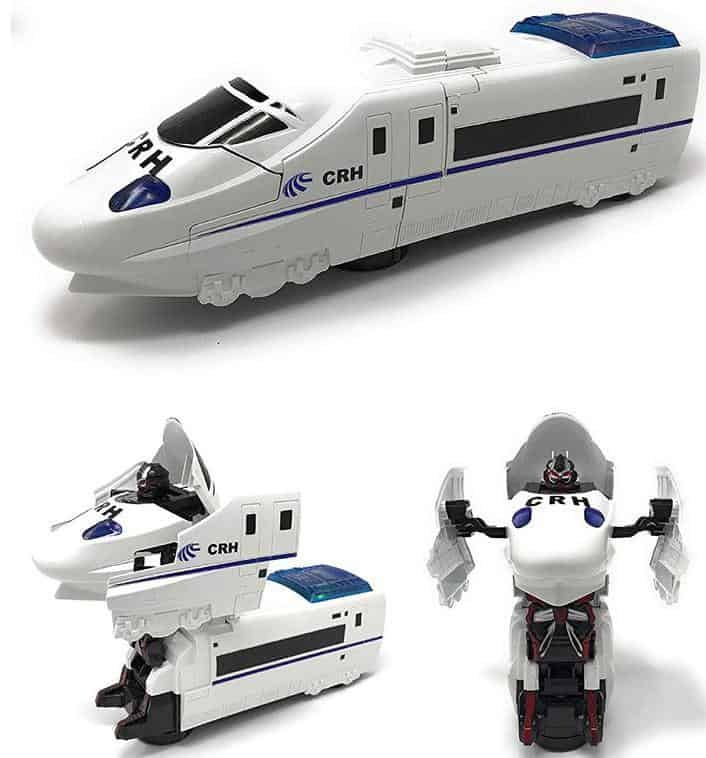 Why we like it: Kidsthrill toy train features an advanced transformers-like design which turns the train into a robot. This toy train is a two-in-one action figure that is both a bullet-shaped train and a robot. Also, the train runs on its own and doesn’t require anyone to control it. Kidsthrill train features a well-designed bullet-like shape that proves as compelling for toddlers and when it turns to a robot, the train shows how advanced its design is. The train features a bump and go action mechanism which helps it change the direction once it hits an obstacle, so the train can move freely around the place. This toy features realistic sounds and lights which add up to the overall kids’ excitement while playing with it. The mechanical transformation is smooth and helps the children explore advanced mechanisms from an early age. The toy train features a great transformers-like design. Kidsthrill train is made of high-quality materials that ensure the toy’s longevity and optimum performance. Realistic sounds and lights make it more exciting to play with the toy. The toy is not suitable for rough use. Why we like it: Lukat train toy car is made of high-quality and child-safe materials and features a colorful design which is adorable for children who are up to 3 years old. This electric toy train is a fun machine which sings and comes with an exciting lighting system which keeps your toddler’s attention occupied for hours. The toy features a unique design which is intended to be both entertaining and educational as it’s colorful, but also comes with play options which improve your child’s cognitive development. Also, Lukat train toy features bump and go mechanism which lets it avoid the obstacles once it runs into any. This means that Lukat train toy car can follow your child’s tempo and be a great playing partner. Also, the train comes with 3 activity balls which your child has to throw in the outer chimney of the train. 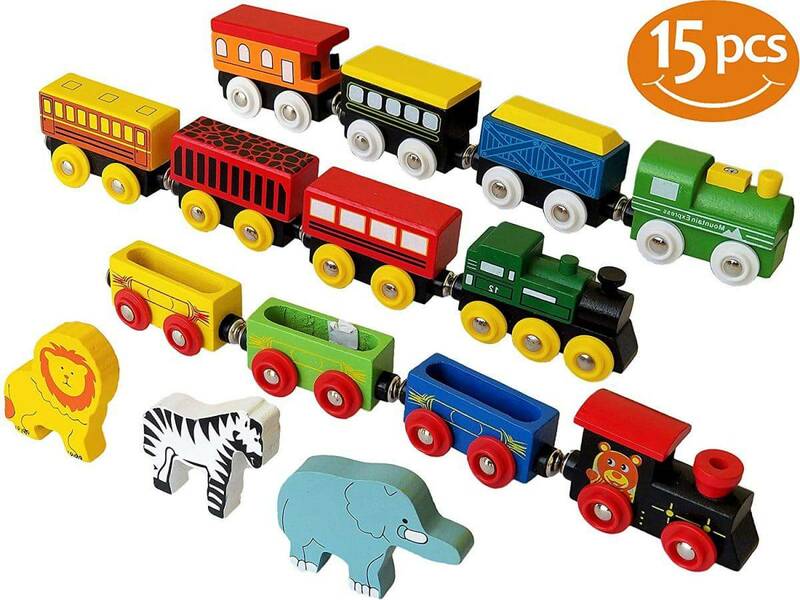 Lukat toy train features a playful and colorful design which your child will adore. The toy is made of high-quality and child-safe materials. Aside from basic toy functions, this toy train has educational benefits for your child. It’s a bit hard to control the toy in the beginning, so you need to read the instructions carefully. Why we like it: VTech alphabet train is an advanced learning toy designed to improve your child’s cognitive abilities. 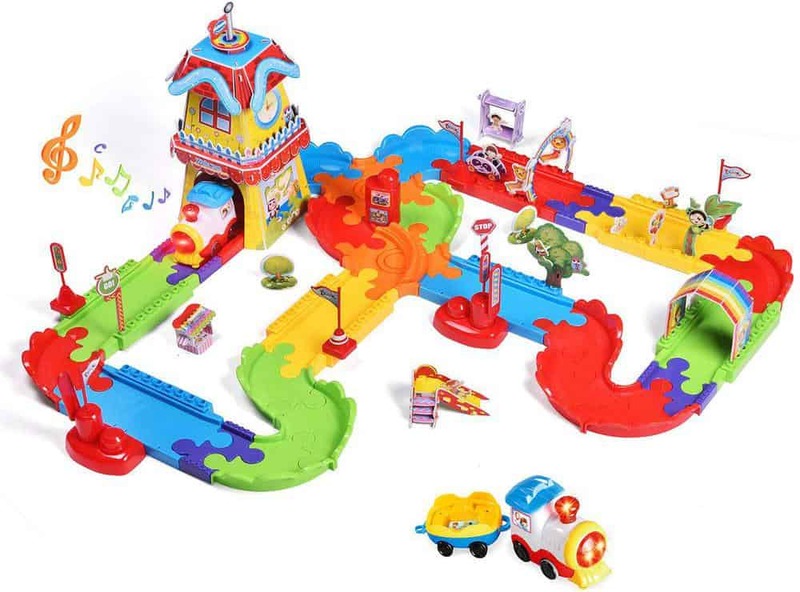 VTech toy train features three modes of play: floor play mode, walker mode, and ride-on mode. Each play mode is meant to encourage different sorts of child’s physical activities. This toy is meant to be an interactive early learning center that teaches your kid letters, numbers, colors, songs and stories. The toy has a goal to maximize your child’s fine motor and cognitive skills like color recognition and learning numbers and alphabet. Also, ride-on play mode features motion sensors that activate a sound when moving. 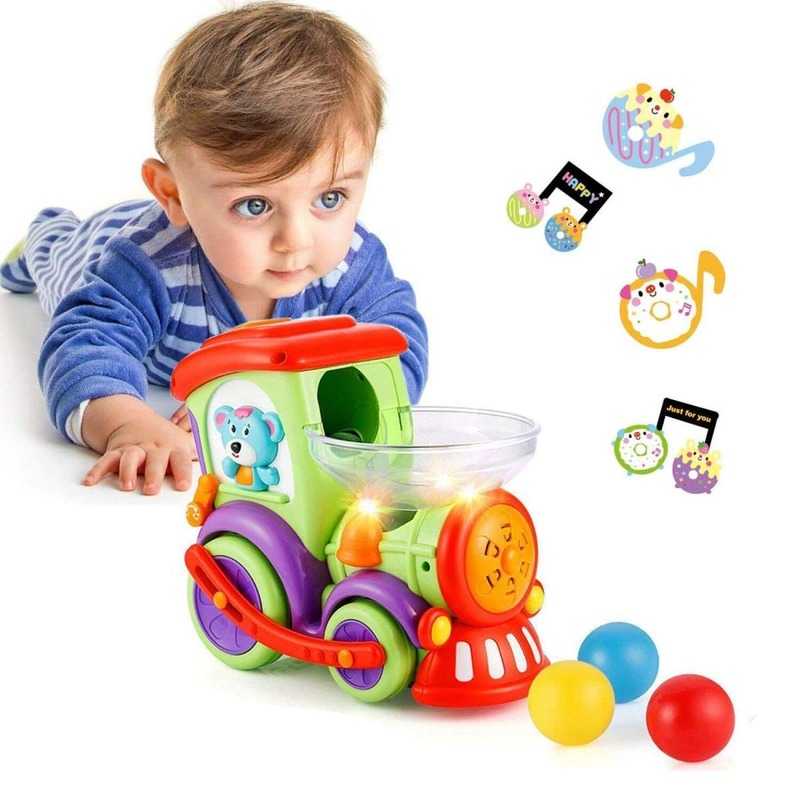 The toy is also designed to introduce your child to playing musical instruments as it has five colorful piano keys that produce adorable sounds. The toy is an advanced learning center that improves your kid’s cognitive skills. 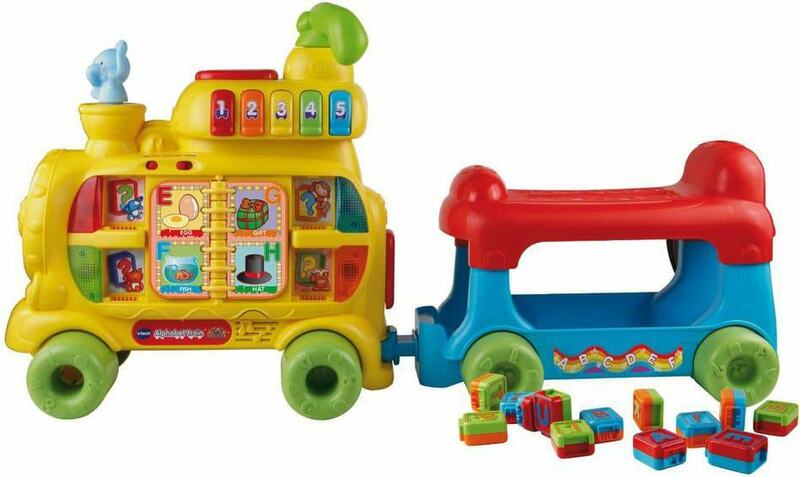 VTech toy train is made of high-quality and durable plastic material. Different play modes will keep your child’s attention occupied. Some users report problems with toy playing the same song over and over. There are various types of toy trains on the market with each toy having its own unique functions and overall benefits. Some train toys feature basic action figure functionality that is designed for instant fun, but some toys feature sophisticated structure and educational features that can benefit your child’s cognitive abilities. Each sort of toy trains will bring your child joy and hours of imaginative play. After this thorough review, we hope that it will be easier for you to see which sort of train toys will benefit you and your child the most.